Screened porches are entirely screened in on all sides to maximize air circulation and are often used for relaxing or socializing. They are quite popular in the Midwest and Southern U.S. states where bugs and pests can be a problem in the warmer months. 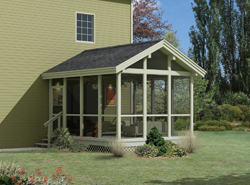 These porches can also be popular for creating outdoor sleeping areas near lakes or mountains. Our collection of screened porch plans includes many styles and sizes perfect for all types of architectural styles of homes. We offer detailed blueprints so you can perfectly picture the finished look of your project. With a wide variety of plans, we are sure that you will find the perfect do-it-yourself project to fit your needs and style.